Have you ever wanted to view how the galaxy was form or what scientists at NASA are seeing? Now you can with the new Microsoft Wordwide Telescope. 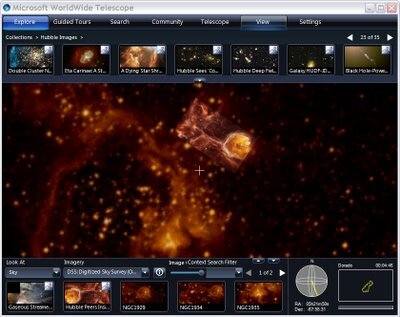 The WorldWide Telescope (WWT) is a Web 2.0 visualization software environment that enables your computer to function as a virtual telescope, bringing together imagery from the best ground and space-based telescopes in the world for a seamless exploration of the universe. Choose from a growing number of guided tours of the sky by astronomers and educators from some of the most famous observatories and planetariums in the country. Feel free at any time to pause the tour, explore on your own (with multiple information sources for objects at your fingertips), and rejoin the tour where you left off. Join Harvard Astronomer Alyssa Goodman on a journey showing how dust in the Milky Way Galaxy condenses into stars and planets. Take a tour with University of Chicago Cosmologist Mike Gladders two billion years into the past to see a gravitational lens bending the light from galaxies allowing you to see billions more years into the past. WorldWide Telescope is created with the Microsoft high performance Visual Experience Engine; and allows seamless panning and zooming around the night sky, planets, and image environments. It has been in the Microsoft Research Lab for quite a while now, and let’s just hope that there will be other useful apps released to the public in the near future. a very nice site. excellent! dear sirs,with my best compliments, Iam willing to have the installing software in my computer in order to allowance me for searching and monitoring the moving of all planets as soon as possible and prefer to have it free of charge.